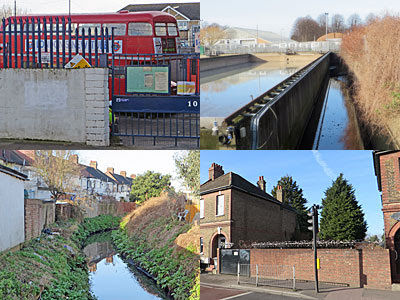 To find the start of the Dagenham Brook, make your way to St James Street station in Walthamstow and head down Coppermill Lane. The parallel residential streets cease before the reservoirs kick in, where St James's Park (not that one) exists to give local dogs somewhere to run amok. Follow the railway viaduct down to the big river - that's the curve of the Lea Flood Relief Channel - and look for the much smaller brook beneath the bridge. 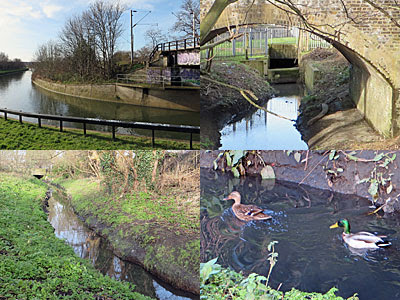 The Dagenham Brook emerges from pipes on the far side of the railway line, fed in from the upper Lea, and traces one side of a triangle of pleasant woodland. Almost narrow enough to step across, a muddy footpath follows one bank while the backs of allotment sheds abut the other. This is the Low Hall Wood Nature Conservation Area, a dead-end corner where I stumbled across a man leaning against a remote tree trunk reading the paper. His eye never wandered from the printed page as I stepped onto the riverbank for a photo, but why he felt the need to hide out here beats me. The brook continues along the edge of the Low Hall Sports ground, home to two recreational mouthfuls. The Leyton Orient Advanced Soccer School Football Club (LOASS for short) kickabout on one side, while the Asian Cricket & Sports Club step out from the Mohsin Beg Pavilion. These Leaside marshes are also home to a substantial industrial presence, sprawled out across extensive yards and warehouses, thoughtfully tucked out of sight of suburbia. Let's not go there. Instead the closest through road to the Dagenham Brook passes a memory of its Victorian past - the Walthamstow Pumphouse Museum. No longer required to move water, the building houses two restored Marshall steam pumping engines, while the yard is outside is rammed full with mechanical and transport ephemera. I spotted a Routemaster, a steam locomotive and a Victoria line carriage, as well as other machines that help tell the industrial story of the Lea Valley Corridor. Closed for a refit since 2013, the Museum hopes to reopen with a splash on Sunday 1st March, and those of you who like this kind of thing should put that date in your diary now. For the next mile, sightings of the Dagenham Brook become somewhat intermittent. There's one from Cockerell Road, a residential cul-de-sac seemingly squeezed in for the sake of it, with the lingering whiff of water tanks and a recycling centre adding to the challenge of living here. A strip of allotments block direct public access south, hence a ridiculously roundabout route is required to follow the river fractionally dowstream. The residents of Luther King Close seem particularly unwilling to welcome visitors, slapping up 'Stop' and 'Private Property' and 'Vehicles will be removed' signs with such abandon that I decided their management committee must be a bunch of joyless isolationists. Nevertheless I strode through to catch a glimpse of the river, as directed, and can reassure you that the view through the railings isn't worth the bother. Rather more tasteful, and completely out of character in this part of town, is Tudor Court. A grassy close of mock-timbered houses leads down to the river, hidden behind a swoosh of garages, in sharp contrast to the Victorian terraces that cover most of the southern half of Waltham Forest. Acacia Road is one of these, and Theydon Road another, the latter sloping down to the river on a gradient steeper than the trickle at the bottom would suggest. I sparked the curiosity of several locals by pausing on Bridge Road to take several photos of the river that passes between their back gardens, but I think I got away with it. I was less inconspicuous on Lea Bridge Road, waving my camera over the top of a wall at the narrow channel passing underneath. I'd never noticed the brook here before, labelled 'Lee Bridge Road Culvert' by the signwriters at the Environment Agency, and continuing equally incognito on the other side. 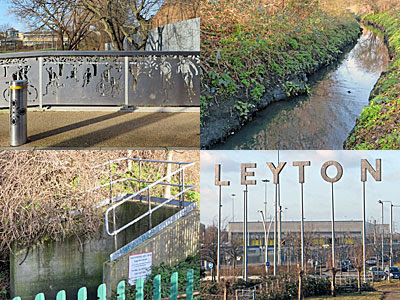 Somewhat appropriately, residents of Dagenham Road are the last to have gardens backing down to the brook, while on the opposite bank is the homeground of Leyton Football Club (the ordinary one, not the Orient). After hiding behind more allotments and a secondary school, the Dagenham Brook finally reemerges along the edge of Leyton Jubilee Park. Formerly known as Marsh Lane Playing Fields, it was given an Olympic spruce-up a few years back, and is now a livelier place to play. In a fenced-off corral at the bottom of the park are the relocated Manor Farm allotments, infamously shifted to make way for London 2012, now finally acquiring a smidgeon of the character of their predecessor. Closer to the brook the Eton Manor Athletics Club HQ building is now shared by a fully accessible (and very reasonably priced) cafe, decorated with external teagarden mural. And alongside is a swish new bridge over the river, with punched-out motifs in the metalwork depicting various forms of sporting activity, rather grander than the waters beneath would seem to demand. As part of the park's rebirth a riverside path has been created alongside an elevated nature reserve, this now the most pleasant part of the brook's two mile flow. A series of pipes and culverts of various diameters feed in, with that beneath the wiggly footbridge being particularly broad. Past Ive Farm the river cuts a deep channel approximately two metres wide, before one final footbridge links the path to Orient Way. You're not supposed to carry on, but a minor track leads to the edge of yet more allotments, and the chance to tread carefully down the bank to the water's edge. Public access goes no further, with the final quarter mile proceeding unseen behind a scrappy hedge along Orient Way. Look carefully just before the recycling centre and you'll spot the concrete portal where the Dagenham Brook heads back underground, presumably to duck beneath the Eurostar depot and enter the Old River Lea unseen. The watermills at Temple Mills are long gone, but the brook which fed them still somehow survives.